Apple on Tuesday updated its laptop offerings with a new version of its 12-inch MacBook. The company upgraded the processor and graphics subsystem, boosted battery life, and expanded the color choices. Apple offers two standard configurations of the new MacBook with Skylake processors that are an upgrade over the Intel Core M Broadwell processors in the previous MacBook. The $1,299 model comes with a 64-bit 1.1GHz dual-core Intel Core M3 processor with Turbo Boost up to 2.2GHz, 4MB L3 cache, and 256GB of PCIe-based onboard flash storage. The $1,599 model has a 64-bit 1.2GHz dual-core Intel Core M5 processor with Turbo Boost up to 2.7GHz, 4MB L3 cache, and 512GB of PCIe-based onboard flash storage. Each model has the option to upgrade the processor to a 1.3GHz dual-core Intel Core m7 processor (Turbo Boost up to 3.1GHz) with 4MB L3 cache for an additional fee of $150. There’s no option to upgrade the storage, however. 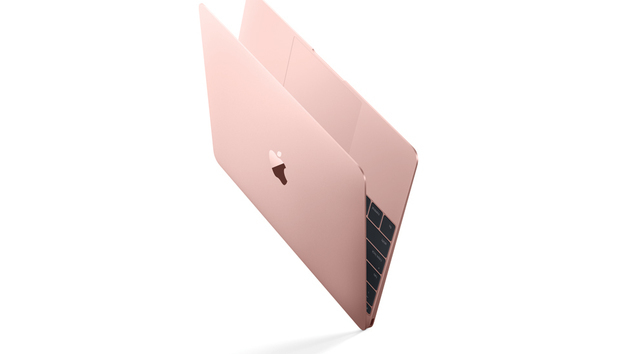 All MacBook models come standard with 8GB of 1866MHz LPDDR memory and Intel HD Graphics 515 with support for a resolution of 2304-by-1440 pixels. The MacBook still has a single USB-C port that supports the USB 3.1 Gen 1 protocol (5 Gbps) and can be used to connect external displays. Apple claims that the battery life has improved, stating 10 hours of “wireless web browsing” and 11 hours of “iTunes movie playback.” That’s a boost of an hour for each usage over the previous MacBook. Macworld has a full review of the 12-inch MacBook in the works, so stay tuned. Editor's note: Updated to correct the USB-C port specifications.